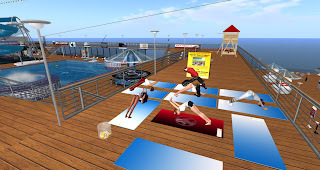 Yoga is always relaxing and here at the SS Galaxy we couldn't agree more! Our Health and Wellness manager Sammy Reddevil gives Yoga classes on a regular basis. Bet you didn't know we could flex that way did you? SL decided to throw some people the advanced "look mom no arms" class. If you missed out on this class don't worry we will have another one again soon. Just check our calendar for the next time (usually Thursdays at 9am).